Don’t get duped, by a dispensary or company, regarding the contents of your Cavi Cones. If you find a reliable one, cherish it, and share with your friends. You’ve probably seen Cavi Cones in dispensaries or taken a bangin’ hit from one at a friend’s house. Mostly likely though, despite the great high, you have no idea what is in a Cavi Cone. We’re here to dispel the confusion: what are Cavi Cones? What is a Cavi Cone? If you were to cut open a Cavi Cone, it should look like the above image. A Cavi Cone is a perfect trifecta of bud, concentrate, and kief. Yes, Cavi Cones are and should be, swoon-worthy for each and every cannabis lover. They cost far more than a pre-rolled joint because they should get you so much higher. See that golden sheen? Kief is a magical topping, friends! Due to the concentrate and kief content, Cavi Cones are great for sharing or passing between two cannabis connoisseurs. While some dispensaries will sell pre-rolled Cavi Cones similar to joints, a company called Caviar Gold sells a variety of Cavi Cones. 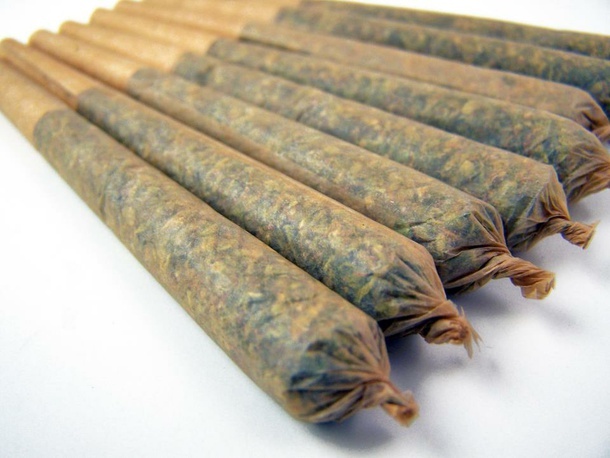 They offer different flavors and guarantee that each cone contains .5 grams of hash. Do not get stooped! There are a number of things that Cavi Cone are not! Cavi Cones are not cone shaped joints. They do not only contain bud. They should not contain stems or trim. A number of dispensaries will try to sell you cavi cones that look like the pic above. This is a gross failure of a Cavi Cone. If you suspect the $20+ Cavi Cone you have been purchasing looks like this, stop buying it. If in doubt about what is in your Cavi Cone, ask your budtender. If their description of their pre-rolls doesn’t sound quite right, don’t waste your money. Additionally, even branded Cavi Cones have been known to deceive cannabis users, so cut those things open if you’re in doubt. Don’t get duped, by a dispensary or company, regarding the contents of your Cavi Cones. If you find a reliable one, cherish it, and please share with your friends.